EA Exec Claims DRM Is a "Failed Dead-End Strategy"
EA Labels President Frank Gibeau claims that DRM is "not a viable strategy for the gaming business." Good news, everyone! Digital rights management, better known in the parlance of gamers as DRM, is dead. So says no less an industry luminary than Frank Gibeau, the president of EA Labels, who said at the Game Developers Conference this week that DRM just doesn't fly. "DRM is a failed dead-end strategy; it's not a viable strategy for the gaming business," he told GamesIndustry. Gibeau's comments were made in relation to the disastrous launch of SimCity, which was mercilessly dashed upon the rocks of an always-on internet requirement. Lots of folks viewed the situation as yet another example of DRM gone wrong, but Gibeau said DRM never entered into the conversation - SimCity's connectivity requirement was simply an unavoidable consequence of "building a massively multiplayer experience." "What we tried to do creatively is build an online service in the SimCity universe and that's what we sought to achieve. For the folks who have conspiracy theories about evil suits at EA forcing DRM down the throats of Maxis, that's not the case at all," Gibeau said. "At no point in time did anybody say 'you must make this online'. It was the creative people on the team that thought it was best to create a multiplayer collaborative experience and when you're building entertainment... you don't always know what the customer is going to want. You have to innovate and try new things and surprise people and in this particular case that's what we sought to achieve," he continued. "If you play an MMO, you don't demand an offline mode, you just don't. And in fact, SimCity started out and felt like an MMO more than anything else and it plays like an MMO." 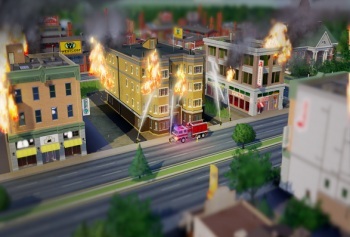 Criticism of SimCity's always-on requirement intensified after it was discovered that the game doesn't actually require a connection to remote servers in order to operate: Modders were able to get the game functioning offline in relatively short order and with only minor losses of functionality. Gibeau's statement leads to an interesting question: At what point does DRM stop being DRM and start being an integral component of gameplay? Using Steam as a template, it's arguable that EA could claim to have abandoned DRM simply by making Origin a requirement of using its games. It's semantics, of course, but it worked for Valve - could it work for EA too?